CEO Elon Musk is already saying he'll need more cash from investors if Tesla Motors acquires SolarCity. The biggest problem with Tesla Motors (NASDAQ:TSLA) acquiring SolarCity (NASDAQ:SCTY.DL) may ultimately be the cash needed to run both companies. Tesla isn't offering cash as part of the acquisition, but it's burning through it as it builds out the Gigafactory and Model 3 factory, and SolarCity's business model of building solar systems that customers pay for over 20 years takes billions more in financing. New information revealed this week could show just how much Elon Musk's companies may rely on investors for cash to keep his businesses afloat. Subsequent to June 30, 2016, Tesla has received notices of conversion from holders of approximately $422 million in aggregate principal amount of Tesla's convertible senior notes due 2018 ("2018 Notes"), which conversions require Tesla to repay the principal amount in cash. Tesla expects to pay this amount in the third quarter of 2016. In other words, investors who had sold debt to Tesla Motors want their money back. Since they had convertible debt, they had exposure to the upside in Tesla Motors' stock price. Now that they want out, it indicates that debt investors would rather have cash in hand than exposure to Tesla Motors' stock, a bearish sign for the company. Tesla is currently planning to raise additional funds by the end of this year, including through potential equity or debt offerings. It's hard to project exactly how much money Tesla Motors and SolarCity will need to fund operations going forward. But we can get some clues from what they've spent in the past. Below is a chart of the money both companies have spent on operations as well as what they're investing in capital expenditures. The SolarCity capital expenditure figure is larger than Tesla because it owns most of the solar systems it installs. 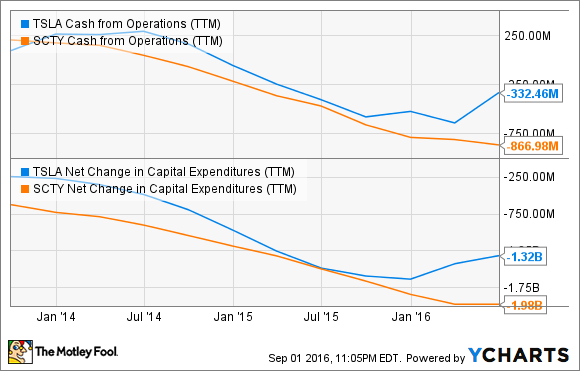 TSLA Cash from Operations (TTM) data by YCharts. Growth is making the cash burn worse, and combined SolarCity and Tesla Motors have burned through $1.04 billion of cash in the first half of 2016. Companies can't spend that kind of money without getting cash from somewhere. And in the case of Tesla Motors and SolarCity, the debt and equity markets have been big providers of cash. 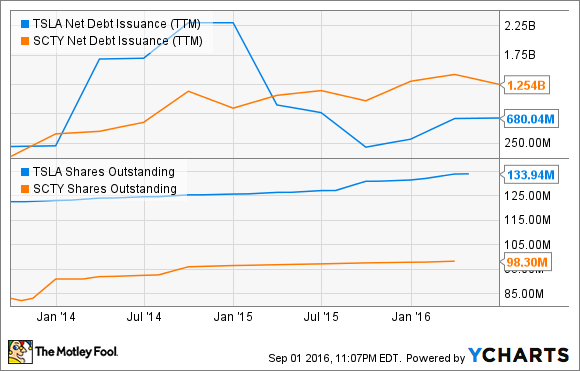 Below is a look at the net debt issuance over the trailing 12 months for both companies and the rising share count. As you can see, billions in financing is needed to run these companies. TSLA Net Debt Issuance (TTM) data by YCharts. Is a cash crunch coming? What's worrisome for both companies is that their expansion plans are built around the confidence investors have in giving them new money. If money dries up, or becomes too expensive, both businesses could be in dire straights almost overnight. By the look of trading Thursday, investors don't seem excited about another round of debt and equity offerings to fund Elon Musk's ever-expanding energy vision. And we'll need to see if he can turn that narrative around or if this is an enduring problem both companies will have to deal with.